Nicholalala is an weekly webtoon on WEBTOONS that explores fantasy and folklore in the context of the Korean countryside. This week’s episode is part of an ongoing story exploring a particular folklore story. How to be annoying in your marriage. Cold Feet! We revisit quite an old comic from the blog! Are you the North Korea in your relationship? Do you deliberately provoke? Are you a totalitarian dictatorship? No… wait… that doesn’t sound right. The real question: Are you the type to put your cold feet on your partner? Hugh also elbows me a lot and does weird things like steals extra pillows and puts them on his stomach, or scrunches covers into a ball and sleeps with it like that on his stomach. Recently he even stole the pillow I had for my back (so much pregnancy back pain at moment) and had it resting on his stomach whole sleeping! But I am a super light sleeper and I get up in the middle of the night several times. I tend to open and shut windows while half asleep or just move things around. I also will randomly put my hand on Hugh’s arm in the middle of the night, which can make him jump. As annoying as a partner can be during the night, when you are used to them sleeping next to you, when they aren’t there it can be even harder to sleep. This video was filmed over a month ago so my pregnancy isn’t showing as much and Hugh isn’t as skinny as he is now. I’ve been really busy with the book finally being released soon. Every day talking with my editor, re-doing things, drawing extra stuff for it. But I’m excited to finally have a book for the Korean market, which will hopefully be the first of many. We have lots of exciting stuff coming up, so please subscribe to us on YouTube! Also let us know what comics you’d like us to talk about in future videos! Hugh can give good massages but can also be a total cheapskate and want to use every last bit of lotion, even though we had a new bottle of it. I don’t really appreciate him banging the bottle against my back! But of course before I could get really angry his insistence that it was an ancient Asian massage technique made me laugh. I do like and appreciate Chinese massages and this was not one of them! I shouldn’t complain too much though because Hugh has had to give me a lot more massages since I became pregnant and I know it can get annoying. But just get the new bottle of lotion out! Are you good at giving massages? What tips do you have? It’s quite intense work and I honestly don’t know how professionals get through full days of massaging people constantly. My hands and arms get tired after about 5 minutes of giving a massage. Have you also made up bullsh!t and insisted something was cultural, but really you were just being an idiot? I feel like Australians do this a lot, (drop bears anyone?). But Hugh has a much bigger pool to draw from when bullsh!ting since so many things fall under the category of “Asian”. 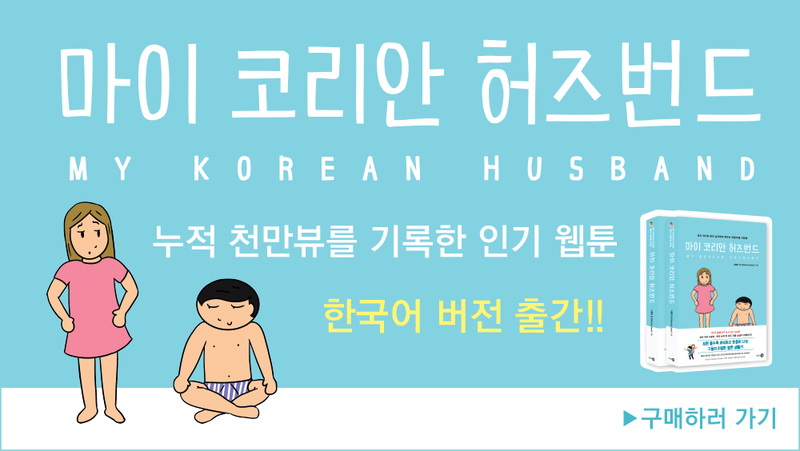 It’s been hard for me to get a new comic up on the blog lately because I’ve been working on the last few things for the My Korean Husband comic book (in Korean) that will be published soon. This book is for the Korean market and will be available in Korean book stores (and online). Combining pregnancy with a lot of sitting at desk and drawing work hasn’t been that great for my back, so I’ve been relying on massages even more these days. Once the book is released I look forward to many more comics on here and more videos. (Make sure you subscribe to our YouTube channel). Nicholalala is a weekly mostly fictional webtoon series on WEBTOONS. You can read on the site or on the app. It combines fantasy, humour and elements of Korean folklore.